This dish makes a great mid-week meal that comes together really quickly. It's low in carbs, high in healthy fats and electrolytes. It will keep keto-flu away - one serving provides over 80% of your daily potassium and 40% of your daily magnesium! It's also relatively high in calories and protein, and ideal for those who practice intermittent fasting while following a keto diet. 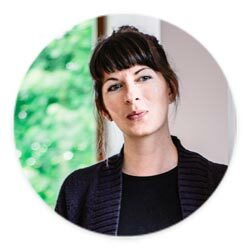 This means that if you often skip meals and only have two large meals per day, this keto meal is the ideal option! 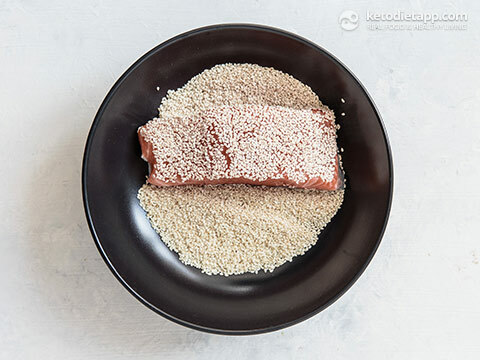 The salmon is coated in sesame seeds, which is a great way of adding not just flavour and texture, but also creates a really delicious crunch. 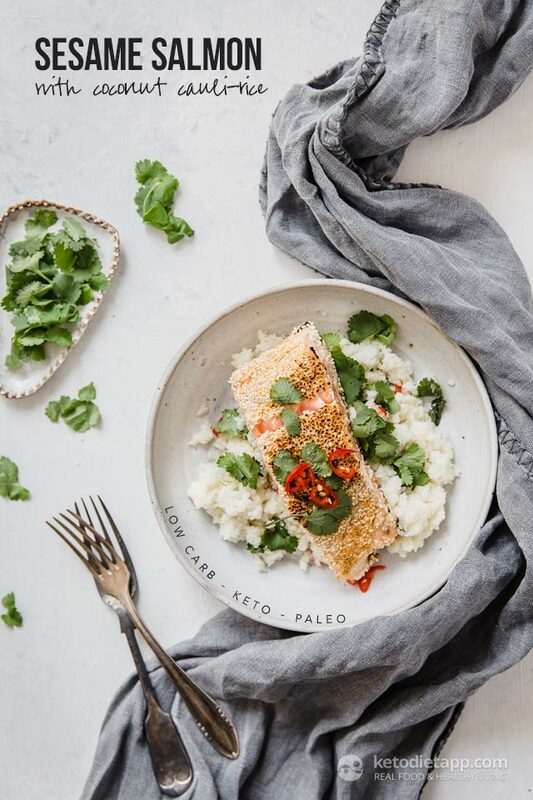 It’s served on a bed of creamy coconut cauliflower rice, and is freshened up with fresh coriander leaves. I also love some thinly sliced chilli stirred through but if you’re not a fan of spicy flavours this could easily be omitted. 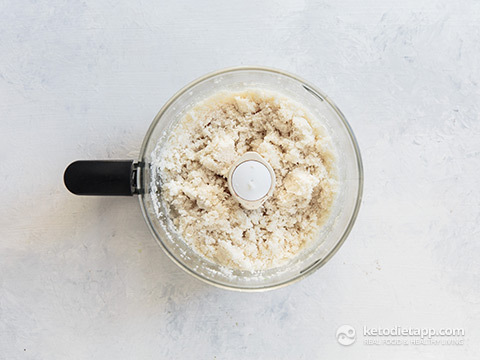 Place cauliflower in a food processor and process until it resembles rice, being careful not to over process. Cutting the cauliflower into smaller florets, or using a grating blade, will help with this. Heat a pan over medium heat. 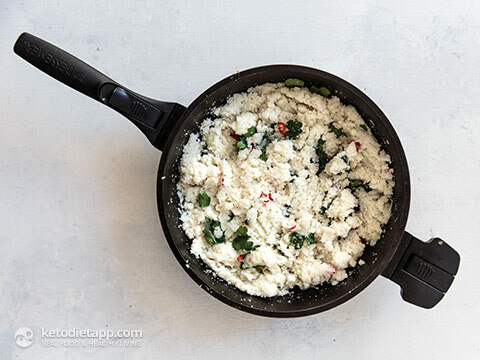 Add the coconut oil, and once hot, add the cauliflower. Cook, stirring, for around five minutes until the cauliflower is nearly cooked through. Add the salt, Erythritol and stir to combine, then add the coconut cream. Cook, stirring, another minute or so until the coconut cream is absorbed. Stir through coriander and chilli and set aside. Heat another pan over medium heat. Place the sesame seeds on a plate or shallow bowl, and coat both fillets with the seeds. Once the pan is hot, add the remaining 2 tablespoon of coconut oil, and gentle place in the salmon fillets. Cook 6 – 8 minutes, turning half way through. Note that for really thick fillets, you may need an extra minute or two. 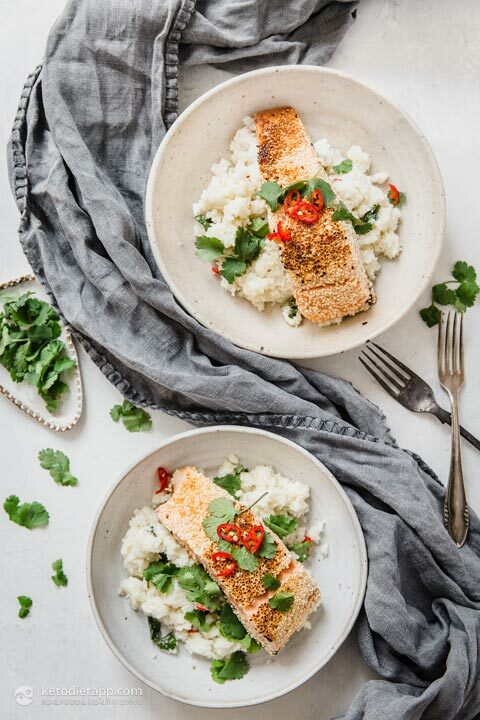 Divide the cauliflower rice between two plates, and then place a cooked salmon fillet on top of each. Top with extra coriander leaves, and serve immediately. Hi! This recipe sounds awesome, but is there a typo on the calorie count? 800 cal per serving doesn't sound right. Thanks! !